All times are Central Cornfield Time and as always you can find my latest schedule week to week here. While I have talked about my reasoning for these changes on stream in the last week, I’d like to write a quick summary for why these things are changing for a quick reference. With regards to Sub-Only chat – this is something I had entertained doing in the past, but had always ended up deciding against. Recently, though, as my community, and Magic as a whole, has been growing it has become harder and harder to keep up with the rate at which my chat is moving. Meaningful questions were being lost in the churn. This past week we gave Sub-Only chat a test drive on stream and, while my viewer count was down a bit as a result, I feel like the overall quality of my content was better. It felt good not needing to moderate as much and being able to catch almost every single question that was posted in the chat again. I feel like Sub-Only chat will result in a better overall product for the people who directly support me which makes it a worthwhile change. For people who are watching my content, but not subscribed, remember you can still interact with me after the fact on my videos on YouTube. With regards to my schedule – as Arena and my stream grew at an absurd rate during January and February of this year I let streaming consume almost every bit of my time. Being live for 50+ hours a week meant I was working close to 80 hours most weeks with all the extra things I do during my offline time to stay organized. While I love this job and I am incredibly grateful to have it, I need to strike a bit better work-life balance overall. Scaling back my live hours a bit will allow me to do this, while still providing a quality of content I am happy with. These changes here are not required to be permanent and as I collect more data after making them I might adjust them a small amount. As always – a huge shout out to all the folks who make this weird thing I do a job for me. My content is sponsored by viewers like you so thanks for keeping me around while I grow as a content producer and person. Status: There is currently no slow. Learn how to submit a deck here. You are however still allowed to cheer / donate to boost existing decks in the queue to see them sooner rather than later. The goal of this slow is to allow me to work down the number of the decks in the queue. While I am up front with how the system works, I feel a bit bad that someone has to wait too long if they submit a deck with the base amount of money. When I get the queue back under 40 decks will reopen donations at the $10 amount again. In general I want people of all means to be able to get a sweet idea they have on stream at some point. We have found many awesome decks from the base amount donations and I wouldn’t want to miss some of them in the future. Because the queue is public, decks often get funded by multiple people. One person adds a deck for the base amount, but then multiple other people bump it up towards the top sooner. Sometimes a $10 deck turns into a $30 deck by the power of Hooglandia’s community. At the end of the day this is kind of an absurdly wonderful problem to have. I cannot express how grateful I am for all the support the community has given my content this year. I wish I had more hours in the day to play all your awesome decks as soon as possible. I’d like to extend a small offer to any aspiring Magic streamers out there – if you would like I am willing to coordinate hosting your channel at the end of my normal streams. You can find my approximate schedule for a given week here. Find a stream or two where you think you can be live around the time I plan to wrap up and then reach out to me on Twitter here so we can coordinate. Keep in mind I primarily stream Modern and some Legacy, so the people I host to your channel will be more likely to stick around if you are playing one of those formats. 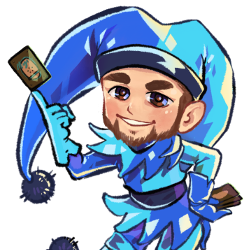 The Magic community has been absurdly generous to me since I moved into streaming full time in recent months and I want to do my best to use my platform to not only benefit myself, but also the Magic community as a whole. At the end of February I wrote a short post thanking the community for their support and talking about reinvesting that support into more streams. Time flies when you are 3-2ing Modern leagues with sweet decks so here I am writing another post about stream stuff two months later. The support has continued to be generous, so today I would like to share that I am reinvesting into more and better content again. Starting next week I will no longer be double dipping as streamer and nanny at the same time. This means when I am live, 100% of my focus will be able to be on creating the best content I can. For those who love the kids, because let’s face it they are cute, they will still be making cameo appearances on occasion. As always, this is a rough outline and will change on occasion. For instance I still plan to do occasional “post event” streams on Saturday / Sunday nights here and there when I am home. You can always find my schedule for a given week updated live here. You’ll also note that in addition to more Magic hours, I’ve added a few hours of Hearthstone to my schedule. I recently started playing Blizzard’s CCG and I’ve been enjoying it a lot. Had some folks asking if I would stream it on occasion so I am adding it into my regular schedule for the Summer to see how it goes. As always, thanks for the support folks. My subscribers and my sponsors are the reason I am able to do what I do – so thank you for enabling me. See you live soon I am sure! Links are enabled. Feel free to share decklists and related things. Having fun is a main goal of this channel. Any comments that are meant to incite negativity won’t be tolerated. If you see a play that is wrong / bad – explain why it is wrong / bad. Help me (and the rest of chat) learn why it was a mistake. Don’t just spam !punt and without context. Generate discussions. For example if you think we should be playing a card in a given deck list don’t just say “Card X is good in this deck.” Say “Card X is likely better than Card Y that you are already playing because it serves Z function”. The first is just stating your opinion. The second provides context to why you feel the way you do. If you break these rules you will be quickly timed out. Rules are subject to change and are managed at my and my moderator’s discretion. Think before you type. Read your message back to yourself before you press enter. Streaming is something I’ve always done just because it was something I enjoyed doing. Playing card games in general is a great time and streaming lets me be engaging and use some of my education background while gaming. It always made some money, but never enough to justify calling it a “real” job. As such I was still teaching / tutoring / doing free lance writing to supplement this. The response to my spending more time streaming has been overwhelming to say the least. My Twitch “sub point” count, which was under 200 for the longest time, has ballooned to over 800 currently. Past just the subscribers, the donation decklists we’ve been doing on stream have been a huge success. Not only in letting me free roll MTGO leagues, but also for finding some really awesome and interesting decks to play. I just wanted to make this note to say how incredibly grateful I am to the community for the support they have provided as I’ve produced more Magic content. I have no idea if this will last long term, but while the support is here I plan to do my best to invest some of this money back into making more and better content. My first step towards improving the content is going to be hiring a sitter a couple hours every afternoon I am streaming to help bridge that gap between when Declan wakes up from his nap and when my wife gets home from work. While my kids are awesome, cute, funny, and many other things – one thing they are often not is quiet! For those who love seeing the kids – we will still have Declan and Jake cameos I am certain – I just want to reduce the number of moments where I have to mute myself due to a random toddler meltdown over YouTube buffering or a toy needing to be shared. In closing – just again – thank you to everyone who has added their support as a Twitch subscriber in the last few months. You all are the reason I am able to do what I do, as often as I do it. I would also like to give a special shout out to Aner0nix who has single handily sponsored a bunch of extra stream time recently through some very generous bits. This is a short post to lay out the details of how the deck queue works on the stream. Continue reading to learn how to get me to shill your favorite deck for you! The first step in submitting a donation decklist is filling out this Google form. You should always get confirmation I am willing to play your deck before sending a donation for it. I reserve the right to refuse any list for any reason. In general I am willing to take a crack at any tier’d deck or anything especially sweet (read: turn 1-2 kills). Once I have confirmed I am willing to play a list you have sent me you should send a donation using this link. In the donation comment be sure to include a link to the decklist as well as your Twitch username. I will build a deck list around a card, cards, or rough idea of your choosing. You should always confirm I am willing to work with your idea before donating – because sadly not all cards / ideas can be made into something competitive. Once you send a donation the decklist you submitted gets added to the deck list queue. Decks generally get played in the order they are in the queue. Don’t like waiting? Me neither! Thankfully money talks. You can throw a kicker donation on top of the base amount to push your deck’s democracy points up. For every $1 / 100 bits sent a deck gains an extra point towards how soon it gets played. So for example a deck that has been waiting 14 days would have the same points as a deck that had $14 extra dollars donated for it. As an extra bonus any donation over $40 will get a 20% bonus. People who support me a good deal do not need to wait as long. As a thank you to my $25 (tier 3) subscribers you get a free modern / standard decklist submission on the house! Just fill out the Google Form while being sure to indicate that the submission is for your tier 3 sub. As a bonus for being consistently awesome your monthly donation list choice will also come with $30 worth of democracy points. While $10 (tier 2) subs do not get to add a deck list every month – they still support me extra so I give you a little bit extra back! As a thank you to my $10 subs, every month when you resub you can add 10 bonus points to a deck you like in the queue so it comes up faster. Q: Are you a sellout for doing this? Q: How long does a deck get played for? A: Magic decks are played for a minimum of two matches. Q: When does my deck get played? A: When it gets to the top of the deck queue. Total points is Dollars Donated + Days in the queue. Q: Can I make changes to my deck while it is waiting to be played? A: Yes! You are encouraged to keep testing / tuning a list while it waits in the queue. Simply update the list at the link you have provided to put in the queue. The day before I play the deck I will download the latest. Q: Do I have to provide cards for the deck I donate to see? Q: Can you notify me when you are playing my deck? A: Not likely. It is hard to predict when a deck will get played exactly because people donate to move different things up almost every stream. Q: If I can’t watch my deck live will there be an archive of it being played? A: Definitely. All of my streams get archived to my YouTube channel here. Q: Can I donate to move someone else’s deck up the donation queue? A: Yep! Who am I to refuse your money? Q: What else can I pay you to do on stream? A: I don’t know – How much money do you have? 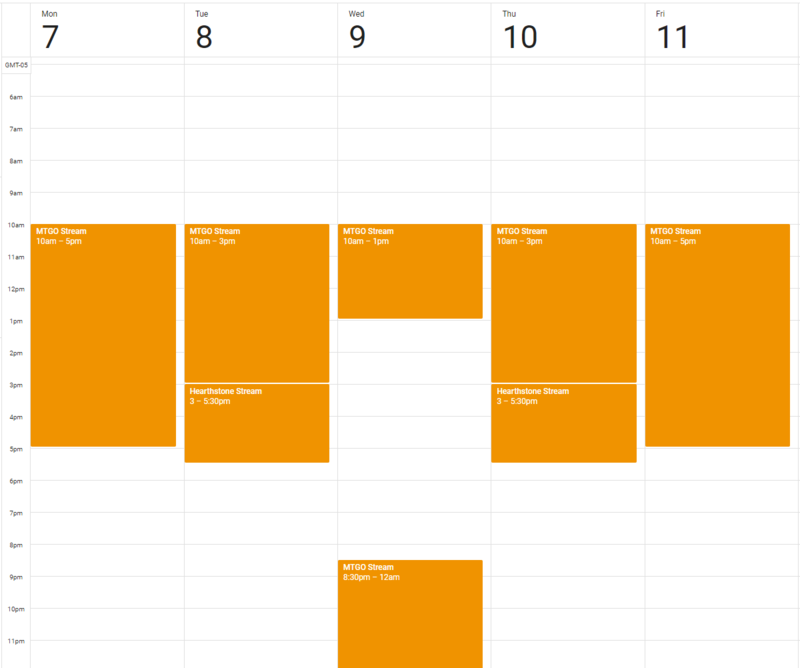 Summer is almost here so I am pushing my schedule around a small bit to accommodate more time outside with the kids. Since I’ve expanded into doing some original YouTube content now as well, I am going to use some of that to supplement my schedule, with the goal being putting out some amount of new content every day. While I enjoy drafting like crazy, I think putting out videos every day was not only stretching myself a bit, but it was stretching how much content people had time to watch – especially on the days where I had stream archives posting as well. Only doing two pre-recorded drafts a week means I can make sure they all have full commentary for the draft and game play portions. This schedule change will take place starting this weekend. Thanks everyone for watching and as always extra thanks to everyone who supports my content directly on Twitch and Patreon. Due to the brevity Twitter requires I was unable to fully explain why I felt this way in this single tweet. I wanted to take a second and write why I feel the way I do about playing music while streaming. First – lets assume everything is setup and balanced well. The music is loud enough for me to hear, but not so loud that it drowns out the content the streamer is creating. If I enjoy this music (or am neutral about it) I will not mind. If I dislike the music I will likely leave. In this case the streamer lost a viewer because they did not like the music, even if they wanted to watch the content otherwise. Now – the common response to this is some people watch twitch streams explicitly for the music. In the digital age today, it is very easy to share playlists of music. Pandora, Spotify, and other services easily allow a stream to have a link that says “listen to my music” below their stream. This allows for people who want the streamer’s music to enjoy it, while not turning off people who dislike it. Even my smart phone can play music while watching Twitch at the same time. The other defense of music on stream I heard from several people is that the streamer just wants to listen to music. Using modern streaming software, like OBS, a streamer can very easily select individual audio channels to send to their stream. They can very easily listen to their own music while streaming and not share it with the rest of the world directly. Not playing music directly on the stream also has the added benefit that any archives you create will not be muted for copy right reasons. This means people who like the streamer’s content will be able to see more of it. Being able to archive things without audio disputes to a place like YouTube can also be an additional revenue source for streamers. Finally – Yes I used to play music while streaming. I did it because most people I watched stream did it and it seemed like the norm. I realize now that it lost me viewers then for the reasons I list here and I am glad I stopped doing it. Taste in music is subjective. Regardless of how many people are enjoying a stream’s music, it is always costing the content creator some viewers who dislike the music. There is a reason major sporting / eSports events do not play music as an underscores to their shows – it is a net positive not to. For my live paper Magic streams for the last two weeks of the year we are going to be trying out something a bit different. We are going to take 16 “tier 4” modern decks, throw them in a bracket, and then battle them out on camera to see which unknown deck comes out on top. We are going to make this a bit interactive though! Once we know which 16 decks are being played, we are going to publish a bracket. People can then submit their own copies of the bracket predicting which decks will win where. At the end of the 2 nights of streaming, we will select the correct (and possibly most correct) brackets to send some Magic related goodies to. So what is the point of this post you ask? Well – we need your help selecting which 16 deck are going to do battle! Please vote in this poll for the decks you would most like to see. Whichever 16 decks have the most votes come Monday December 12th will be slotted into the bracket.